The mutable materials of the artist’s sculptures are continuing the creative process that she began. Within weeks, the 34-year-old sculptor, suffering from a brain tumor, passed into a brief final coma. Yet the end of her life proved to be only the beginning of her career. The couple of solo gallery shows she hustled in the 11 years following her graduation from the Yale School of Art have since been eclipsed by multiple posthumous retrospectives at major museums from the Guggenheim to the Hirshhorn to the Tate, and when one of her rare sculptures still in private hands appears on the market, collectors come bearing more than floral arrangements. However there is another crucial respect in which Hesse’s work has survived her. In contrast to traditional bronze and marble, or even the steel and lead used by contemporaries such as Richard Serra, the materials she favored are notoriously archivally unstable. Over the past 40 years, the sculptures have chemically restructured themselves. Her latex has turned opaque and her fiberglass has grown brittle. Were she alive today to see masterpieces such as Sans I (1967–68) and Repetition Nineteen III (1968) she’d probably find them unrecognizable. Museum curators have uniformly responded to this deterioration with distress, and the people nearest to her in life have reacted with anguish. “She wanted her work to last,” Hesse’s close friend Sol LeWitt asserted at a 2000 roundtable discussion about the conservation of her art and the legitimacy of showing pieces in their crumbled condition. “She certainly didn’t have the attitude that she would mutely sit by and let it disintegrate before her eyes.” Echoed by the remembrances of many other friends, LeWitt’s claim is probably accurate, but it ignores bigger questions that have been skirted by virtually everybody. Instead of sentimentally second-guessing what the artist would have wanted—trying to preserve her intentions—we should be asking what’s called for by her art. Does the sculpture want preserving? Is there a point at which it requires retirement? Or is it possible that it is now superior to what it was when she made it? As brief as Hesse’s career was, only in her final few years did she create the art that made that career historically significant. Before turning to sculpture, Hesse was determined to become a painter, apparently because she thought that painting was what successful artists did. Fortunately, she had talent—especially manifest in her psychologically-acute self-portraits—and her frenetic mixed-media collages had a contemporary enough look to land her a 1963 exhibition at the Allan Stone Gallery in New York. The following year, she traveled to West Germany with her husband, the wood sculptor Tom Doyle, who’d been offered a residency by a Düsseldorf industrialist. Their studio space was a former factory with equipment half dismantled, from which Hesse took inspiration by whimsically reenvisioning the machines in biomorphic paintings. Then one day she picked up a loose wire and used it in lieu of a painted line. Over the next year, this experiment evolved into a series of reliefs: sheets of masonite textured with papier-mâché and festooned with protruding cables painted bright colors. “Real nonsense” she called this work in a letter to LeWitt. Yet the nonsense was not senseless. Though visually bungling, the reliefs served as a bridge from predetermined seriousness to in-the-moment playfulness. Hesse’s early painting and collage and drawing all show the professional competence of someone becoming a respectable artist; the reliefs are the unpremeditated products of someone simply making things. The first intimation of what Hesse would achieve dates to 1966, after her return to New York. Shopping in industrial supply stores on Canal Street, near her Bowery studio, she began to amass materials such as rope and fish nets, which she assembled into abstract works that hung on the wall like paintings. The finest of these, Untitled or Not Yet (1966) is a set of nine nets each containing a fishing weight wrapped in polyethylene sheeting, suspended on nails from pieces of string. Since the position of the nails varies from one installation to another, the composition is indeterminate. As a consequence, the work is not autonomous; it exists only in the world and in the moment. This immediacy may be one of the prime reasons Hesse was attracted to latex. Her first two works in that medium, Schema and Sequel (1967–68), are both made up of cast latex objects arranged on a thin latex mat. In the case of Schema, the objects are half-spheres arranged in a 12 x 12 grid. For Sequel, the half-spheres have been joined to make imperfect latex balls that are piled on the pad at random. Like Untitled or Not Yet, these pieces exist only in their installation. And though the mat serves as a sort of frame or platform, the suppleness of the fresh latex reveals every crevice of the floor below, serving as a continuum between the art and the space that holds it. The mats were made by using latex in a way the manufacturer never intended. Industrial latex was meant for casting. Hesse handled it like house paint, brushing layer upon layer to build up a surface that was smooth yet irregular, ragged at the edges like deckled paper. For her, imperfection became an aesthetic verging on fetish, representative of the creative process itself. Hesse sought out the defects—the bubbling caused by poor mixing and sagging due to gravity—that Johns had spent years learning to prevent. In her late works, she did not so much use materials as collaborate with them. This trait is most obvious in the works she made using more than one material, such as Repetition Nineteen, a cluster of open cylinders of papier-mâché, latex and fiberglass, and Sans, a stack of open boxes rendered in fiberglass and latex. Unlike the traditional sculptor who makes a model in one material to be definitively presented in another, Hesse offers every version, all similar in conception, each alive with different idiosyncrasies. Naturally, each is also aging differently. For instance, the fiberglass husk of Sans II has darkened, while the latex boxes of Sans III have curled in on themselves and crumbled and broken. Sans III is one of more than a dozen works that have been deemed “unexhibitable” by curators because they no longer resemble the products of Hesse’s studio. This is a mistake, for Sans III is truer to Hesse’s achievement today than it was when she first showed it in 1968. Despite the protestations of friends such as the poet Gioia Timpanelli that Hesse “was not an artist about degradation” (as Timpanelli asserted at the 2000 roundtable), Hesse’s work concerned her materials, her interactions with them, and theirs with her. Those interactions are still reverberating physically and chemically. The materials with which she collaborated have become her executors. They deserve our respect. In many ways, Hesse was as conventional in 1970 as she was in 1959. When Nemser started spending time with her to research the Artforum interview, Hesse flatly informed her that “there are only a handful of galleries worth visiting or to be shown at,” as if Happenings and Fluxus had never happened, and of course the significance Hesse placed on her bouquet from a “big collector” wouldn’t have been out of place a century earlier. Hesse’s desire that her art last forever—and her oft-quoted admission to Nemser that she felt “a little guilty when people buy it” because they might be disappointed by its fragility—belongs to this professional outlook, and is consistent with her work from before she embarked on her playful pursuit of “real nonsense.” Yet even if she could never fully embrace the consequences of the work she made subsequently, she was at least better able to appreciate it than her friends or the museum personnel so intent on speaking on her behalf today. Through the creative development of her art following her death—the ongoing response of materials to her initial touch—Hesse has escaped the confines of herself and exceeded the limitations of her imagination. 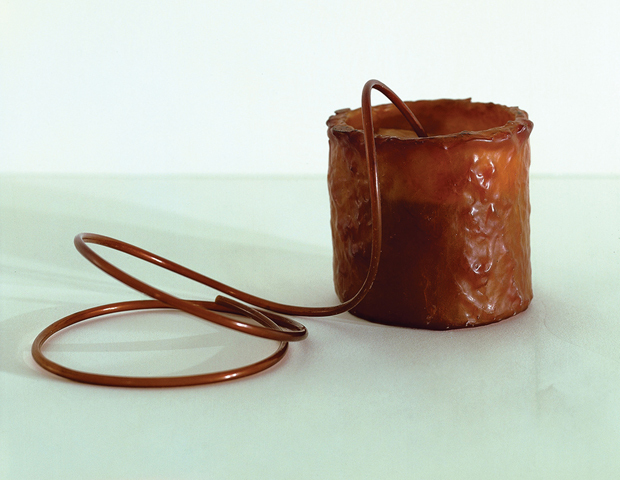 The afterlife of Eva Hesse is her most creatively fulfilling period.